Will Wellington Phoenix’s drastic philosophy change prove costly? Wellington hasn’t ever been seen as a proponent of ‘modern’, attacking football, but with two consecutive finals appearance, this didn’t seem to be a huge problem. A Ricki Herbert side was always strong defensively, physical and organised, and most importantly, produced results. That was, until recently, when the new owner Gareth Morgan recently discussed his desire for the side to play a more entertaining style. The result is that Herbert and the squad are torn between two styles of football – the pragmatic system, and the supposed ‘Total Football’ enforced by Morgan, and there’s been a distinct and alarming drop in form since the controversy emerged. And with real concern now emerging over their chances of making the finals, it seems the project has been abandoned. Against Newcastle, Herbert selected a familiar side, but employed an even familiar approach: Wellington was happy to play long, direct balls towards the channels, and really looked to play out from the back. Instead, Mark Paston kicked long quickly, while Andrew Durante and Ben Sigmund frequently tried to exploit the space in behind the Newcastle full-backs. They only came away with a point, but the whole squad felt far more comfortable within the ‘English’ system, and Durante’s are hugely telling. Tactically, Herbert is an interesting coach – he garnered much attention at the 2010 World Cup with his [relatively] obscure 3-4-3, but has preferred more orthodox 4-4-2/4-3-3 variants with Wellington, despite hinting at a 4-1-3-2 in pre-season. 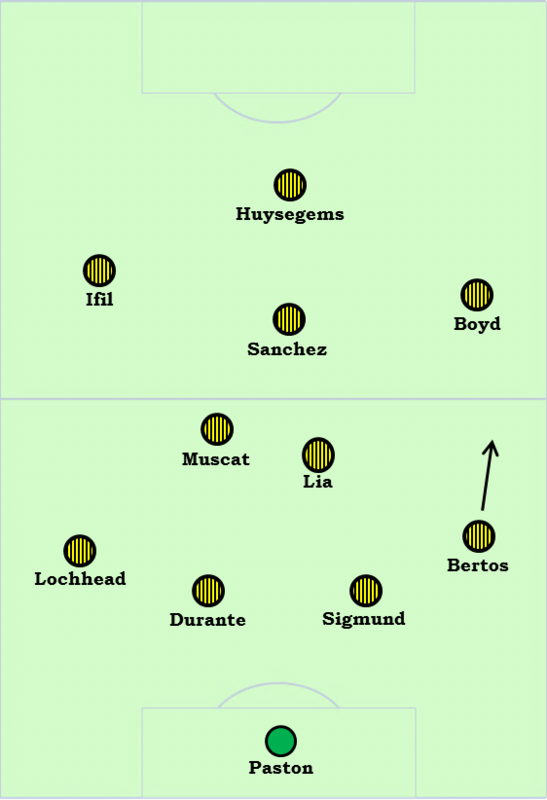 Early in the season, the use of Huysegems as a static target man and poacher was impressive, but the availability of Jeremy Brockie saw Herbert switch to an open 4-3-3, with the attacking trio given licence to interchange intermittently. That rotation became less prominent in the absence of Paul Ifil, a versatile forward capable of playing across the front three. In his absence, youngsters Louie Fenton, Tyler Boyd and Benjamin Totori have been given opportunities to impress. Of the three, it’s Boyd who has probably been most effective, displaying a good awareness of space on the right flank, and capable of crossing from wide or driving in on goal. Fenton played a similar role on the left, but has been used centrally of late, where he’s been a mixed bag – he times his runs into the box well, and provides good energy, but isn’t really suited to playing as part of a midfield two, and needs the freedom a trio affords. Meanwhile, Totori is at his best off the bench, his raw pace and directness causing huge problems for tired defenders. All three are responsible service for Brockie and Huysegems, who are both at their best playing through the middle. On this basis, Brockie is the better option, as he can drift wide, make the attack look more fluid and shoot from distance, but he’s been poor in recent weeks and Huysegems might be better playing off the shoulder. At the other end of the pitch, Herbert has a firmly established back four, even if their form hasn’t always justified such faith. In the centre, Sigmund and Durante are both active, aggressive all-action defenders which make them hugely vulnerable to individual errors. They also have trouble with the positioning of their defensive line – sometimes they sit too deep, creating a huge disconnect between the lines of midfield, while they’ve also been guilty of playing too high up the pitch and been exposed by pace in behind, and this has been a huge problem particularly against the Melbourne Victory. At right-back, Leo Bertos is an attacker moved deep, and offers the greater thrust from defence with constant bursts down the flank. He is positionally unreliable and is often seen as the weak link by the opposition, why try and break quickly into the space he leaves behind. On the left, Tony Lochhead is bulkier and doesn’t attack as readily, preferring to cross from deeper positions. Service from wide is a huge part of the Wellington strategy – aside from Scott Jamieson; they are the two most prolific crossers from full-back in the league with a combined total of 206 for the entire season. In goals, Paston has started every game but has been hugely unconvincing with some poor positional errors and lapses in concentration, and it’s surprising that Glen Moss hasn’t had a chance to prove himself – although Herbert might have considered that Paston understood the importance of playing short goal kicks when they were trying to play more positively. This has been an interesting zone – having previously been content with two functional, robust midfielders, Herbert began to encourage more fluidity and invention. Specifically, he added an extra man with the return of the injury plagued Alex Sanchez, who is a typically precise Spanish playmaker and plays as the most advanced of the trio, drifting across the pitch in search of pockets of space. His movement seems to be the cue for the positioning of the two deeper midfielders, who try and keep a triangle structure to help retain possession. These two players could be termed as a pairing of a ‘#6 and #8’ – Muscat gets forward more often with well-timed runs, while Lia sits deeper and knocks the ball to either flank, although these roles were interchangeable. Their movement serves as a useful contrast between ‘pretty’ and ‘pragmatic’ football – in the Total Football era, they rotated and dropped in between the centre-backs to collect possession, as well as allowing the full-backs to play higher up the pitch. Now, Sigmund and Durante are happy to bypass the midfield completely, meaning their role becomes less about passing, and more about breaking up play. Isaka Cernak has arrived in January, full of running, and will likely challenge Fenton and Sanchez as an advanced midfielder. That point is pertinent – simply dumping a radical overhaul in playing style on players and staff mid-season is bizarre management, and Morgan’s tenure so far has been highly questionable. It remains to be seen whether this blip will cost them a finals spot – either way, this is a highly important lesson for not only Wellington, but for the league in general.